If you all follow me on instagram, you've already heard, but my sweet baby boy (finally) arrived! 13 days past his due date, and not a moment too soon. He arrived on December 3rd at 4:05pm, weighing 8lbs and 21 inches long. He entered the world completely alert and incredibly handsome. The past few days have been pretty surreal. The days have been so sweet - Eric and I spend lots of time just staring at him. He is a champion eater and is nearly back to his birth weight, which is great. The nights can be tough (it's amazing when he sleeps over 2 hours! ), but each night has been a little easier. I'm considering sharing his birth story on the blog... we'll see. I'm also not sure how I feel about sharing his name online, so we'll see how that goes. I apologize in advance for being a little quiet in the blogging world (though I don't feel bad... I mean, I just had a baby hah!). I just wanted to stop in and let you all know that he arrived and that we are all doing well! I'm so excited to see him! (Also that you're carefully dividing life and blog world.) Congratulations again and enjoy your time at home together. 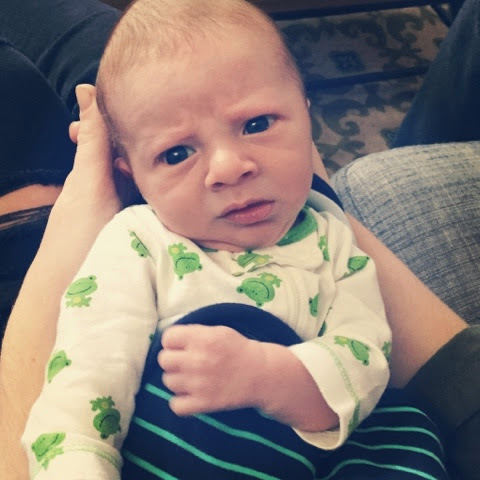 I would have to agree, he pretty darn cute and animated to be just a week old! So good to hear you are doing well! He's pretty cute! I absolutely respect your caution about what to share and how much to share online. It's a weird thing to figure out sometimes. Go with whatever feels right! So handsome! Love how alert he is. :) My daughter is 7 and I am pretty cautious about sharing info and pics of her, so I completely understand! I am not sure how often I have even mentioned her name. Congrats to you! Congratulations!!! Take all the time you need. So glad he's here! Oh my goodness! He looks so much older and wiser in that third picture. He's so precious. Your followers can just know him as button, because, you guessed it, he's cute as a button :) Congrats to you and Eric! Oh yay! I must have totally missed this on Instagram! I'm so happy he is here!! I am so excited for you and Eric! Take as much time as you can and stare because they change SO FAST! And then they start crawling and there is no way you can sit and stare. Enjoy every moment! Congratulations!! What an adorable little munchkin! Congratulations! So sweet. And so tiny in that car seat! What a little peanut. Hope you all continue to settle in well as a family of 3 and enjoy your time off with the little guy. Congratulations! I am so excited for you! They grow so fast! Savor every moment! He is precious!! Congrats, mama! Congratulations! How wonderful to have him home and get to admire him all the time. I'd like to join some of the other readers in saying that I love reading birth stories, but also get that they are totally personal. Also, an adorable nickname for the blog would suit that little nugget! on one hand I want you to blog and instagram like its your job because I'm nosy.. on the other I totally want you to be absent and enjoy this time. And I totally agree with you on the name - I don't have kids but if I am still blogging then I thought I would do the whole letter thing, or a nickname. I don't share names on the blog except for mine, husbands and cats. and I would (creepily?) love to read your birth story. Anyway! Congrats again, he is absolutely precious and handsome and all the good things. Ahhhh congrats!!! He is perfect and I am so happy for you. Also, I follow a few mom bloggers who have shared names by sharing photos of items with the baby's name on it but not actually typing the name. I guess that makes it a lot less searchable? Haha, oh I will DEFINITELY make it clear by the title (and probably a disclaimer in the beginning of the post) what type of post it will be. I totally get it. I really wasn't interested in any birth stories until I was pregnant - then I couldn't get enough! Interesting about the picture of the name... I might look into it! Congratulations, Ashley! I'm so happy for you. Welcome sweet baby boy. He did take his sweet time, but look at him, all worth it at the end. Huge congrats to you and Eric, mamma Ashley. And if my memory serves me correctly, he is exactly a month older than Jess' baby boy. Congratulations! He is a cutie!! ASHLEY! I have absolutely been doing like "celeb baby watch" for you, just waiting to see the little guy! Congratulations! He is so, precious, and already looks like he's bursting with personality! So happy for you and Eric. 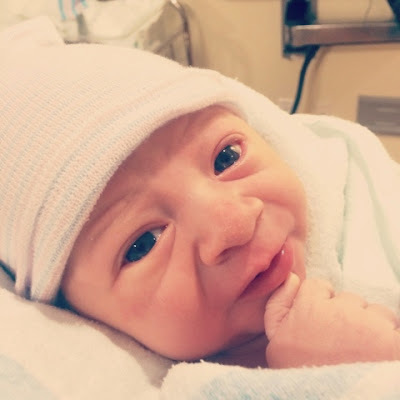 I would happily read a birth story if that's something you want to share! Hope you are having the best season with your new little one. Congrats Ashley!! He is so adorable and the perfect reason to be away from the computer! I'm glad that everyone is doing well!! Congratulations! He is adorable. What an exciting time this must be for you with the holidays and a new baby! I hope you are getting some rest. I know I didn't brush the knot out of my hair for each of my baby's first three months of life. Am so happy for you two! I am sure you are wonderful parents! 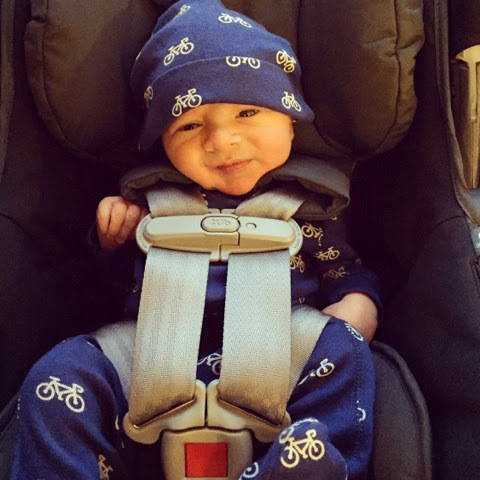 Okay, so I've already gushed about your little guy on Instagram, but since I'm just getting caught up on blogs right now, I thought I'd take the opportunity to congratulate you again and gush even more about your son! He is such a beautiful little guy and I'm glad to hear things are going well for you three! !